The Mulloon Institute has been awarded $3.8 million over five years by the Federal Minister for Agriculture and Water Resources, Hon. David Littleproud, for its project to rehydrate Australia, improve the environment, boost farm productivity and engage the community. "Landscape repair and rehydration through slowing the flow of water can help boost crops and build drought resilience in the future,” Minister Littleproud said. "Already this pilot program has re-established the connection between Mulloon Creek and its floodplain. "This has raised the level of the stream, stabilised the flow and allow the creek-floodplain system to regenerate naturally." Chairman for The Mulloon Institute, Gary Nairn AO, welcomed the announcement. “The support of the Federal Government for our rehydration and regenerative work is greatly appreciated. With that support we will be able to complete a total catchment repair that will be a template for the many catchments across the nation needing rehydration,” he said. The project aims to demonstrate the effectiveness of rehydration activities at property and catchment scales to significantly improve landscape function while revitalising farm productivity. It will provide a living laboratory of landscape rehydration and soil repair, generating enhanced biodiversity, improved water quality and increased primary productivity. Farmers, academics and the broader community will have the opportunity to observe, learn and document the effectiveness of this approach. The funding will be used for vital on-ground works in the Mulloon Community Landscape Rehydration Project (MCLRP) in southern New South Wales, including extensive scientific monitoring and analysis of the project’s impact on the catchment using hydrological, soils, and biological instrumentation. Another focus will be on the training and education of land managers in holistic management, natural sequence farming and regenerative agriculture, along with workshops and field days. TMI will be working with a strong network of established partners, including the Australian National University, University of Canberra, Revolution AG, Maia Technology, HydroTerra and Soils for Life, amongst others. Expected outcomes from the project include valid scientific data showing how landscape rehydration measures can restore landscape function, build landscapes resilient to climatic extremes, improve biodiversity, and increase productivity. “This funding will provide TMI with the resources to fully implement its catchment-scale rehydration and rehabilitation project and enable us to provide training, education and access to tools suitable for landholders to monitor and manage their own properties,” said Luke Peel TMI’s Research Coordinator. 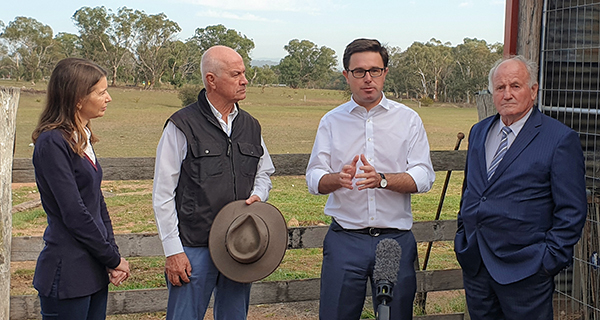 “Most importantly, the funding will significantly boost the scientific monitoring, reporting and dissemination of data and information to landholders and the broader public, reinforcing the scientific and educational outcomes for all stakeholders,” Mr Peel said. Further on-ground works are scheduled for spring 2019 following completion of design and approval from regulators.